While working in Calendar view of Outlook 2011 for Mac, you can click the Organize tab of the Ribbon to display options. You can click in the Search field to find what you’re looking for when your messages build up over time. New Calendar: You can have as many independent calendars as you want in Outlook. To add a new calendar, just click the New Calendar button. The trick: Know that you have to look in the left pane of the calendar window and click its check box to activate it. To give your calendar a name, click the words Untitled Folder and then type a new name. To delete a calendar, right-click its name and choose Delete from the pop-up menu. Scale: In any view except Month, drag the Scale slider left and right to increase or decrease the space between the lines in the view. This is a fun control to use. 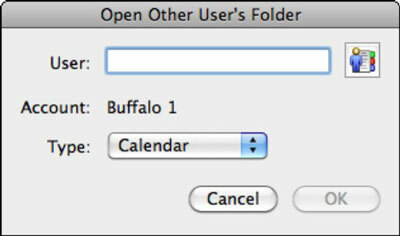 Open Calendar: For Exchange users, click Open Calendar to display the Open Other User’s Folder dialog. Type the name of an Exchange user or click Browse to find the user, and then choose an option from the Type pop-up menu: Calendar, Address Book, or Inbox to open the other user’s shared folder. When Outlook is in Calendar view and you click in the Search field, the Search Ribbon displays. Enter search criteria and then press Return or Enter to display the search results. Click the Advanced button to turn on additional search filters, or click combinations of buttons on the Search tab of the Ribbon to activate filters and limit or expand your search. In the advanced search, use the pop-up menus to choose criteria to apply to your search. The plus (+) and minus (-) buttons add and remove criteria in the search filter. If you want to save your search to re-use it later, click the Save button on the Search tab of the Ribbon. A new item is added to the Smart Folders categories of the Folders list. Before clicking elsewhere, type a name for your saved search. You can’t rename a Smart Folder. To delete or edit a Smart Folder, right-click its name to display a contextual menu.